Larry Chao is an Asian-American - born, raised and educated in the U.S.
His ancestry is half-Japanese and half-Chinese. Larry combines business consulting experience with a high energy approach to engaging participants. Most of his work involves multicultural senior management teams collaborating to align strategies across functions, business units and countries. 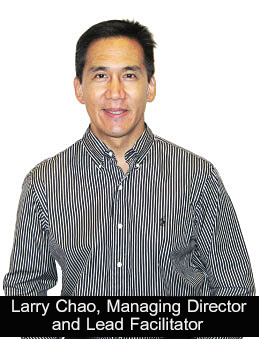 Larry has published in major newspapers - e.g., The Nation (Bangkok), Singapore Straits Times. He has appeared on CNBC and BBC as an expert in organization change.